So I’d like you to imagine for a moment that you’re a soldier in the heat of battle. Maybe you’re a Roman foot soldier or a medieval archer or maybe you’re a Zulu warrior. Regardless of your time and place, there are some things that are constant. Your adrenaline is elevated, and your actions are stemming from these deeply ingrained reflexes, reflexes rooted in a need to protect yourself and your side and to defeat the enemy. So now, I’d like you to imagine playing a very different role, that of the scout. The scout’s job is not to attack or defend. The scout’s job is to understand. The scout is the one going out, mapping the terrain, identifying potential obstacles. And the scout may hope to learn that, say, there’s a bridge in a convenient location across a river. But above all, the scout wants to know what’s really there, as accurately as possible. In order to cultivate the scout mentality, we need to change the way we feel. While that might not be the most intuitive advice, our gut reactions and even our ability to reason are conditioned with the more immediate emotional reactions we have. 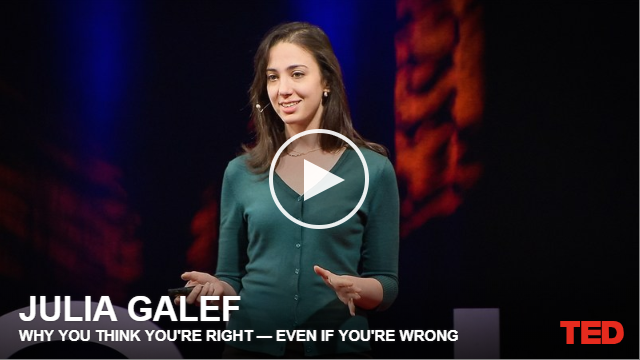 Galef explains that in order to learn to be like scouts, “we need to learn how to feel proud instead of ashamed when we notice we might have been wrong about something. We need to learn how to feel intrigued instead of defensive when we encounter some information that contradicts our beliefs.” To me, that sounds like we also need a healthy dose of humility, and maybe even the humor to laugh at our mistakes, which will let us truly become lifelong learners. 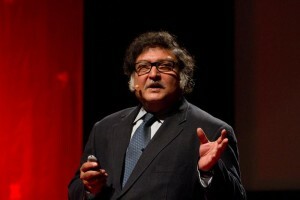 In his 2013 TED talk, Sugata Mitra – educational researcher and winner of the 2013 TED Prize – shares a powerful example of kids learning on their own. Mitra was working at the time in New Delhi teaching computer programming. Right next to his office was a slum and one day Mitra placed a computer in the slum. “I gave a computer to children who never would have one, didn’t know any English, didn’t know what the Internet was.” Eight hours later, when he came back, the children were browsing the internet and teaching each other how to browse. Mitra continued to test the ability of children to learn on their own with just a computer. These experiments culminated in Tamil-speaking children in a south Indian village learning the biotechnology of DNA replication in English from a street-side computer. I think what we need to look at is we need to look at learning as the product of educational self-organization. If you allow the educational process to self-organize, then learning emerges. It’s not about making learning happen. It’s about letting it happen. The teacher sets the process in motion and then she stands back in awe and watches as learning happens. Mitra is continuing his experiments through the organization, The School in the Cloud which is a global experiment in self organized learning. It’s amazing to see how they are tapping into the inner desire to learn.